Glossy Black-Cockatoos are fussy eaters. 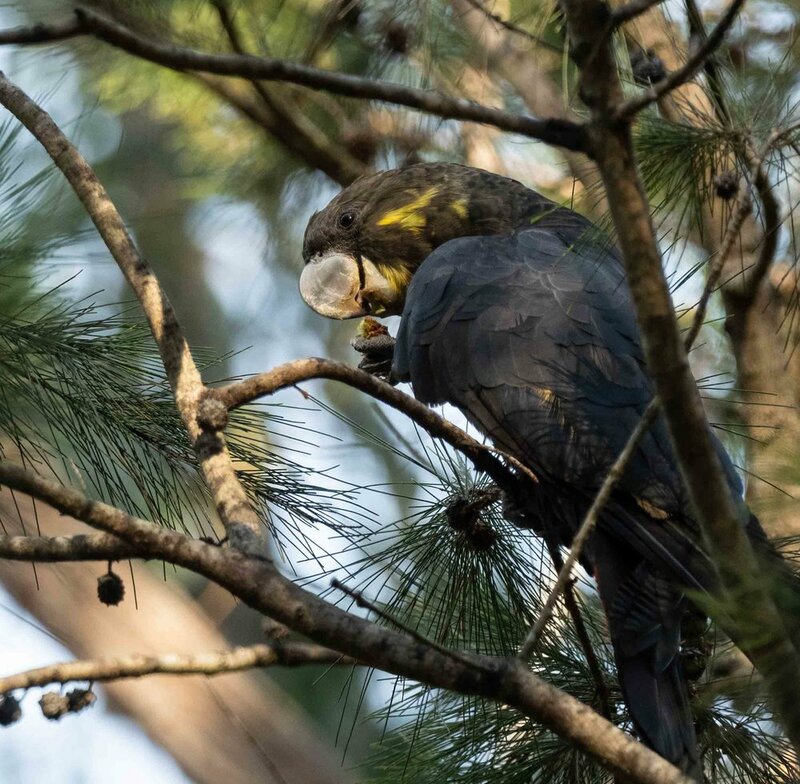 They feed almost exclusively on 'she-oaks cones' – the woody fruit of Allocasuarina and Casuarina trees. 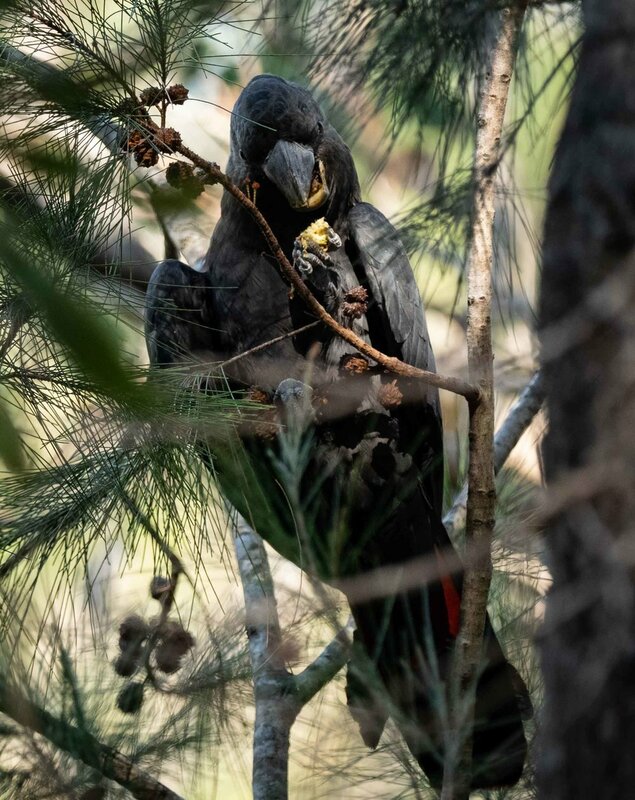 It's not uncommon to see Glossy Black-Cockatoos in the local forests, dropping fragments as they quietly chew on Allocasuarina littoralis fruit. Earlier this week I heard the familiar, rather plaintive call of the Glossies. A group of four birds wheeled about for a few minutes, before settling in the canopy of a very tall, old eucalypt. Then, gradually, one by one, they flew down to the branches of a nearby Allocasuarina ... and quietly started to feed. Glossies' beaks are massive. They have to be strong to break into the woody cones. But they are also specially shaped. The lower beak has a deep notch that the birds use to grip the cone, preventing it from rolling sideways. I have tried using several different tools to crack open a cone, including a nut-cracker, and nothing works. It clearly requires both force AND technique. While gripping the cone with one foot and the notched lower beak, the bird uses its powerful, pointed upper beak to prise the cone apart, shearing sideways. No wonder my nut-cracker didn't work ... wrong technique entirely! Oh, and like most cockatoos, Glossies tend to be left handed. 'She-oaks' are not well loved trees. I frequently hear them called 'rubbish trees'. It's true that they are often scrappy looking. Many snap during wild weather. Or they can simply die, due to insect attack, drought, or other natural insults. 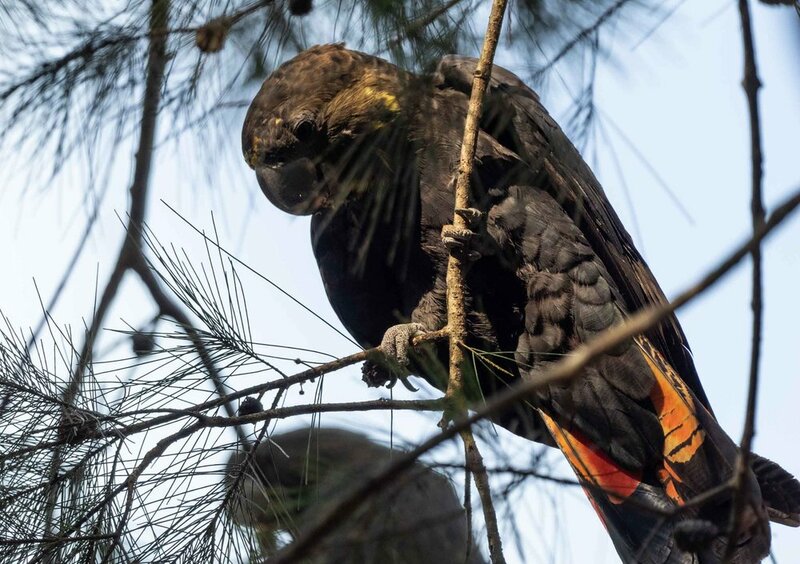 Yet these trees are vital to the survival of Glossy Black-Cockatoos. We have noticed, over several years, that the local Glossies regularly visit specific trees. Some of these trees are rather sad-looking – bent, small, and with scant foliage. So what is it the birds are looking for? Firstly, the feed tree must be female. Most flowering plants bear female and male flower parts on the same plant - usually within the same flower. This is not the case for Allocasuarina. There are male trees, producing only pollen, and separate female trees, bearing only female flowers. It is these flowers - and only these flowers - that go on to produce seed cones. Allocasuarina trees hold onto their cones. A single tree can bear young cones, from last season's flowers, as well as older cones from earlier years. Research has shown that the birds prefer to feed on young fruit. ... and there need to be enough such trees. The seeds are tiny, and the birds have to spend a long time extracting them. They can't afford to waste time and energy flying long distances between feed trees. And if the birds are to breed, they need to find suitable tree hollows within easy reach of their food trees. 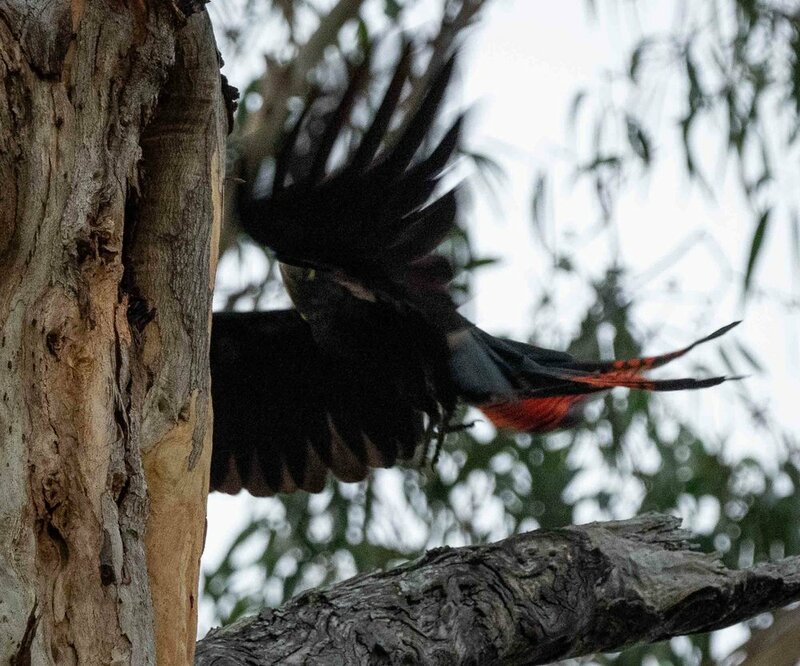 They need large hollows, and research in central NSW has shown that they favour the 'spouts' formed by the broken trunks or large branches of very old or dead eucalypts. Strong winds tore off the crown of a very large Mountain Grey Gum (Eucalyptus cyoellocarpa) not far from the house. And the very next day we spotted a pair of Glossies investigating the top of the broken trunk! It will no doubt be a while before a deep enough hollow forms, but it's a start. Feeding Glossies are not easily disturbed, no doubt because their time is precious. The group of four that I discovered the other day was still quietly feeding, in the same tree, when I left them an hour later. Cameron, M. (2005). Group size and feeding rates of Glossy Black-Cockatoos in central New South Wales. Emu, 205: 299-304.